Black Armband Ecology. 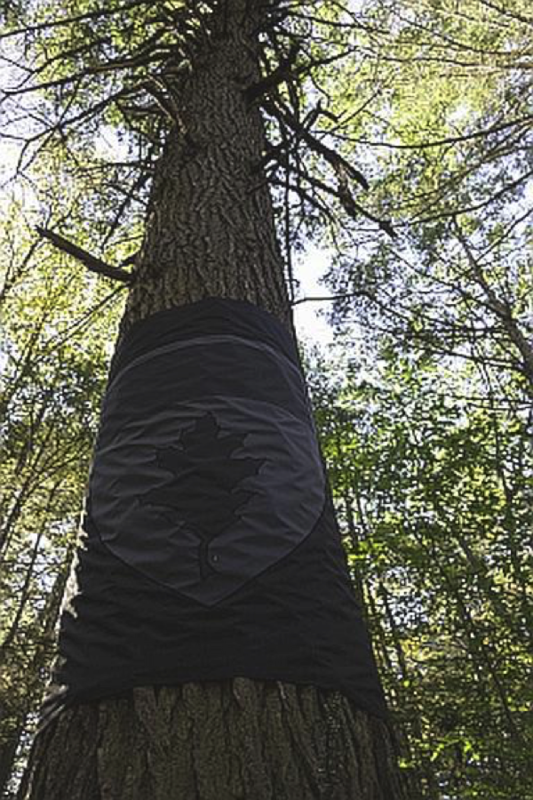 Installation at Harvard Forest, 8 × 5 feet, canvas, thread, and nylon rope, 2017. Collaborators: Jackie Barry, David Buckley Borden, Mike Demaggio & Aaron M. Ellison. Photograph © Aaron M. Ellison. ​Headlines shout that the Earth’s forests are dying as they are relentlessly assaulted not only by rapacious loggers clearing them for agriculture, forest plantations, or simple profit, but also by climate change, air and water pollution, wildfires, and invasive species. Scientists around the world have mobilized to study this potential harbinger of a global tipping point in the state and functioning of the planet’s biosphere. New data-filled technical papers are published nearly every day attesting to the countless causes and consequences of forest die-off around the world. At the Harvard Forest, Harvard University’s 4000-acre field laboratory and classroom for research on forest ecology, we too are documenting and studying forest decline. Although dozens of insects, fungi, and pathogens are currently at or near outbreak conditions in the forests of the northeastern U.S., for more than two decades, researchers at Harvard Forest have been studying the rapid deterioration and death of a single species, eastern hemlock (Tsuga canadensis), at the hands (or rather, sap-sucking mouth) of the hemlock woolly adelgid (Adelges tsugae, a.k.a. “HWA”), a small, mealy bug-like insect that was introduced to eastern North America in the early 1950s. As scientists, we study eastern hemlock because it is a “foundation species,” which disproportionately controls the biodiversity and fluxes of energy, water, and nutrients through the forests in which it lives. As New Englanders, however, eastern hemlock is deeply interwoven with the fabric our history, our culture, and our daily lives. Hemlock Hospice Forest Lantern No. 1. 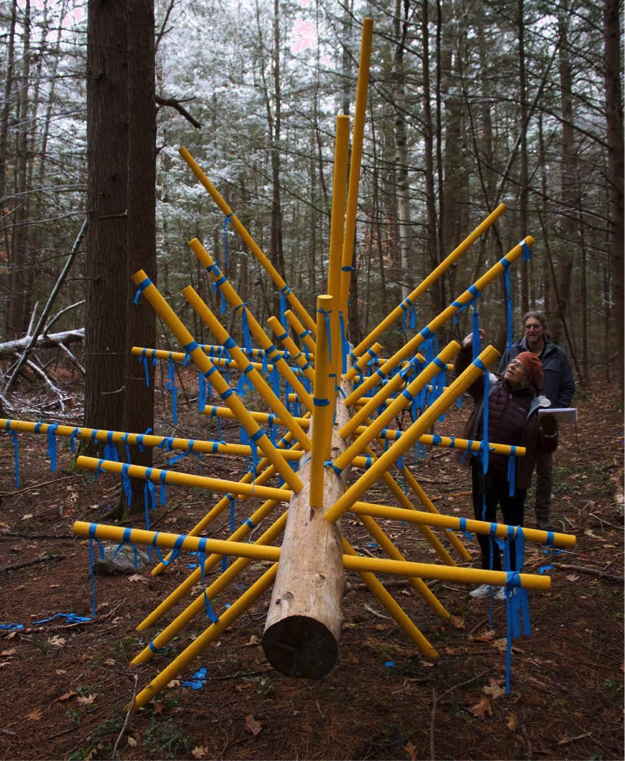 Installation at Harvard Forest, 2.25 × 4.5 × 4.5 feet, wood, acrylic paint, vinyl, and assorted hardware, 2017. Collaborators: David Buckley Borden, Aaron M. Ellison, Tim Lillis & Lisa Q. Ward. Photograph © Aaron M. Ellison. ​We express this intersection through Hemlock Hospice, a year-long art installation along a new interpretive trail through a declining hemlock stand at the very heart of the Harvard Forest. Hemlock Hospice not only gives expression to our emotional responses surrounding the loss of eastern hemlock but also presents a new practice model of scientific research, education, and science communication based on contextual artwork and shared cultural experiences. Here, we explore this model through a discussion of two of the 18 pieces that make up the Hemlock Hospice installation. HWA Tent. Installation at Harvard Forest, 2.5 x 2.5 x 6 feet, wood, acrylic paint, canvas, thread, and nylon rope, 2017. Collaborators: Jackie Barry, David Buckley Borden, Johnny Buck, Mike Demaggio, Aaron M. Ellison & Salua Rivero. Photograph © Aaron M. Ellison. The House of Adelges crest on the back of the HWA tent. Photograph © David Buckley Borden. ​The narrative threading through the Hemlock Hospice interpretive trail intentionally interweaves the cultural and ecological forces at play in the declining hemlock forest. Both the whole narrated experience and the individual sculptural installations are creative hybrids of art, design, and science communication. 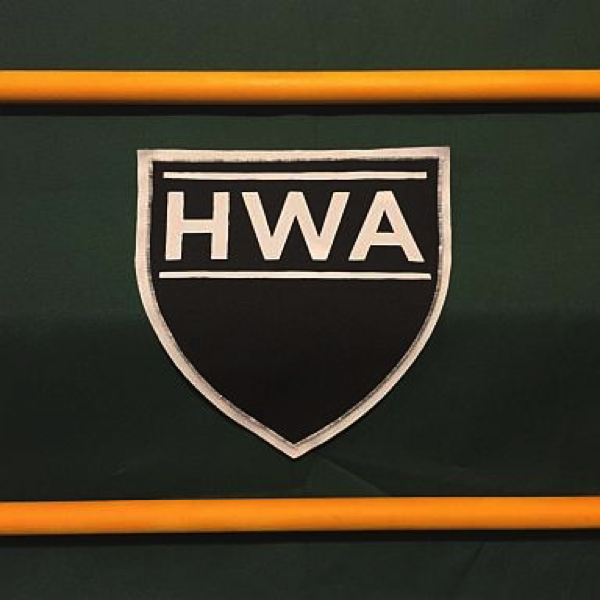 An example of this creative approach is the HWA Tent. Suspended 20 feet above the ground in a grove of eastern hemlock trees, it represents their evergreen needles as temporary homes for the adelgid. The two thin white poles on the underside of the green tent echo the tell-tale characteristics used to identify this short-needle conifer, while the 17 canvas state “patches” illustrate the current range of the adelgid in the United States (since we built the HWA Tent, the adelgid has also been recorded in Nova Scotia). On the other side of the tent, a Harvard University-inspired HWA crest pronounces this to be “The House of Adelges.” In cross-section, the simple canvas tent also plays on the Greek capital delta (Δ), one of the thematic design elements of Hemlock Hospice that is represented here in the classic form of a simple A-frame tent. ​The HWA Tent also pushes back on the cultural construct of “invasive species.” Species like the adelgid are referred to pejoratively as invasive species, pests, or other derogatory terms not only in the popular press but also in the scientific literature. Although often imbued with scientific meaning, these terms really are code words that refer to organisms living in a place where we don't want them to be and behaving counter to our desires or expectations. More importantly, when scientists discuss the ecological and environmental effects of invasive species, we are explicitly ascribing agency to them; the first definition of “invasive” in the Oxford English Dictionary is “of, pertaining to, or of the nature of, invasion or attack; offensive.” In other words, we are asserting that the weeds intend to choke our fields of wheat, the pests mean to be a nuisance to us, and the invasive species planned their entry through our borders. But there is, in fact, no evidence that weeds, pests, or invasive species intended, meant, or planned their actions. Rather, we brought them here, deliberately or inadvertently, and once here, these organisms follow the same evolutionary "rules" that all other species do: survive and reproduce. The adelgid came to the eastern United States on ornamental plants we imported for financial gain. Once here, the adelgid behaved like any other immigrant; it found a place to live, food to eat, and an opportunity to produce healthy offspring. The extensive hemlock forests from Georgia to Nova Scotia, are ideal housing for the adelgid. They provide shelter in the winter and cool, moderated temperatures in the summer. Given adequate food and shelter, the adelgid continues to reproduce and evolve. Its success demonstrates Darwinian natural selection, not insect agency. By highlighting the roles of both humans and the adelgid in the decline of eastern hemlock, the HWA Tent and some of the other Hemlock Hospice sculptures focus attention not only on how we study the effects of the adelgid on the trees, but also on our preconceived notions of what species like the adelgid are, how they should be defined, and our role in transporting them around the world. Most importantly, these multiple foci enable us to constructively frame a discussion about socio-ecological issues. 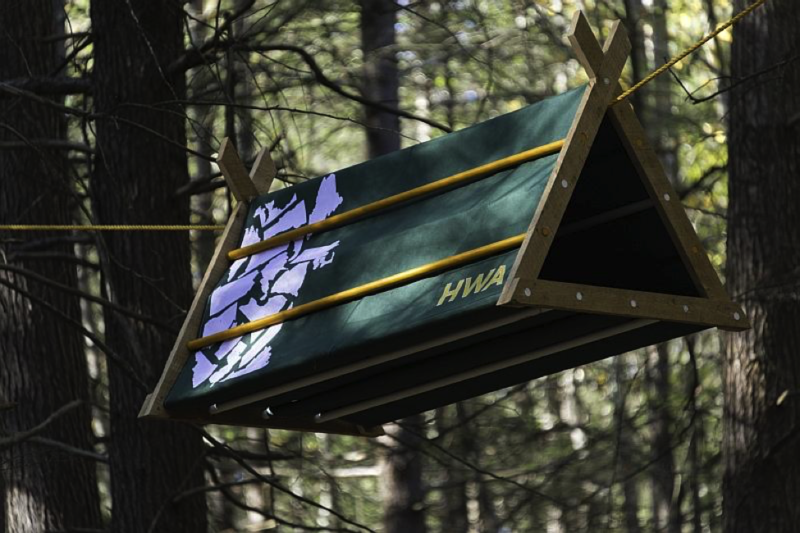 Although research at Harvard Forest has always included the intersection between human activities and forest ecology, installations like the HWA Tent communicate our collective experience in a new accessible, informative, engaging, and aesthetically interesting way. And within Aaron’s own research at Harvard Forest, he now thinks about the adelgid less as an “invasive” species that disrupts ecosystem services and more as just another actor in the web of organisms that maintain the forest in a continuous state of flux. The experience also has generated an increase in empathetic capacity in his practice as an experimental research scientist. Exchange Tree. 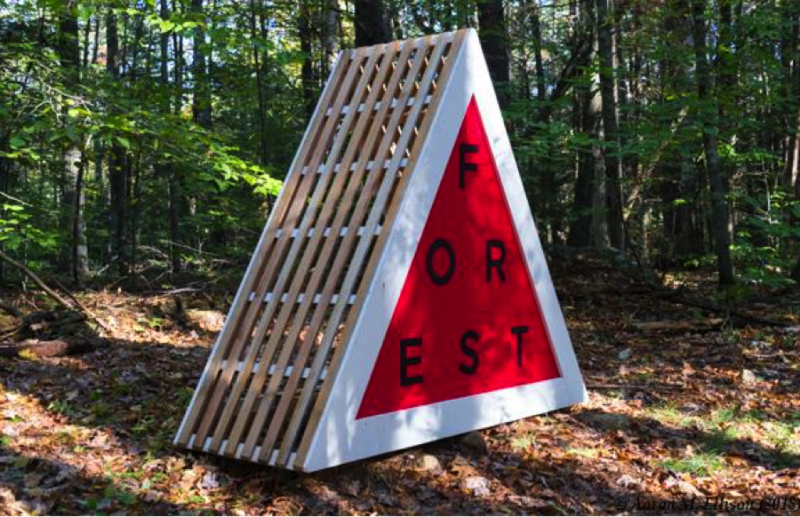 Installation at Harvard Forest, 8 × 10 × 12.5 feet, wood and acrylic paint, 2017. Collaborators: David Buckley Borden, Aaron Ellison, Salvador Jiménez-Flores & Salua Rivero. Photograph © David Buckley Borden. ​Unlike the HWA Tent which gives a new voice to the Harvard Forest’s long-term research in socio-ecology, the Exchange Tree has opened a new avenue of research into how people think about their relationships to forests. The Exchange Tree is one of several sculptures in Hemlock Hospice with which visitors are intended to interact. The form of the Exchange Tree was inspired by the iconic and, unforgettable once seen, form of the fallen tops of dead eastern hemlock trees that have snapped off and remain perched on the ground atop their many limbs. Visitors to Hemlock Hospice are welcome to reflect on the declining hemlock forest by leaving hand-written messages on field flagging, one of the most common materials used by foresters and ecologists in their fieldwork. The personal notes that visitors tie to the abstract branches of the Exchange Tree are much like paper shide tied to shimenawa on sacred trees and other yorishiro within Shinto shrines. In providing an opportunity for visitors to interact with Hemlock Hospice via the Exchange Tree, we hoped to learn how people think about the trees, the past, present, or future forests, and the adelgid. Detail of Exchange Tree and message ribbons. Photograph © David Buckley Borden. ​Part of any good science communication project, whether art-based like Hemlock Hospice or those using other media, is an assessment of its reach and influence. As part of this assessment, we periodically collect the ribbons, transcribe and enter the messages into a database, and are using this database to analyze patterns in responses to the installation. These data are used together with visitation data collected in a sign-in station at the trailhead to document the overall impacts of Hemlock Hospice. Word cloud from 381 ribbons tied to the Exchange Tree between October 2017 and July 2018. 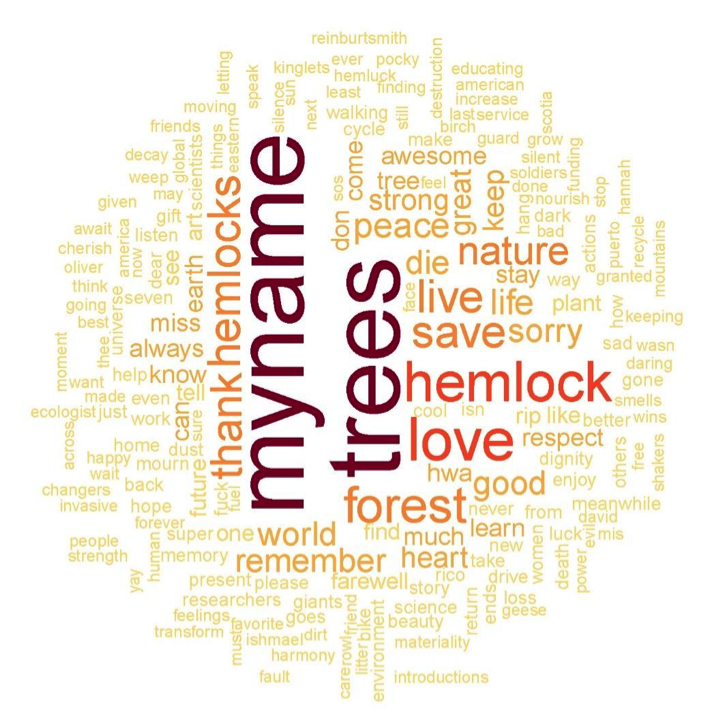 In this word cloud, the size of the word is proportional to its frequency on the ribbons; individual names have been replaced in the database with the word “myname”. ​Nearly one-quarter of visitors simply write their name on the ribbon. Although we do not have any information on visitor age, gender, or other demographic characteristics, we infer from this that a good portion of our visitors may view the forest as simply as an extension of themselves or alternatively, want to recognize their role as a witness to the dying of a hemlock forest. Word cloud from 381 ribbons tied to the Exchange Tree between October 2017 and July 2018. In this word cloud, the size of the word is proportional to its frequency on the ribbons; individual names (“myname”) are omitted here so that it other themes are more readily visible. ​When we remove those ribbons that have only an individual’s name from the analysis, we have a somewhat clearer view of the range of responses to Hemlock Hospice. Most responses are focused on the trees, with emotions emphasizing strength, resilience, resistance to change (“stay strong, hemlocks”), and sympathy for their plight. In contrast, despite our intention to encourage empathy for the adelgid (through, e.g., the HWA Tent), it is routinely reviled in the messages (“die, HWA, die!”). We are just scratching the surface of what can be done to interpret individuals’ responses to Hemlock Hospice and to better understand how people relate to the inexorable decline of a single tree species and the concomitant change in the species composition and structure of the forest stands that it defines and dominates. 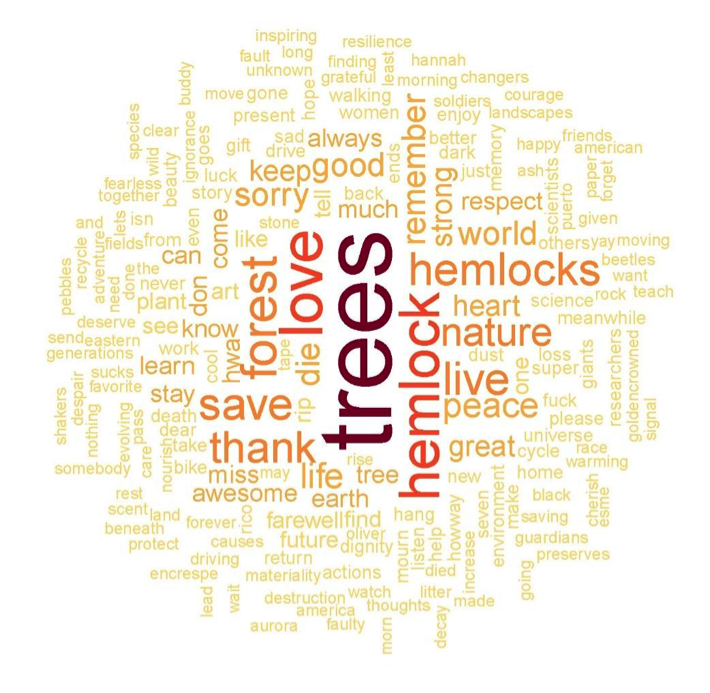 The word clouds suggest that there is broad empathy for the trees and the forest (as a group of trees), but much less for the insects that live within it. At the same time, the messages of strength and resistance to change are in strong contrast to the intent of hospice - acceptance of the ongoing, dynamic changes in hemlock forests and other ecological systems. Our initial conclusion is that even provocative art installations designed to communicate scientific understanding of a complex phenomenon may have a hard time overcoming preconceived notions of forest dynamics (or stasis), species “invasions,” and the zeitgeist of the Anthropocene. The key question posed to contributors of this Special Issue of SciArt Magazine was “how has art influenced your science?” More specifically, the question was framed as “how has engagement with the arts or an artist led to innovation, breakthroughs, and insights in your science?” After several years of successful work together, we think that major breakthroughs or innovations from art-science collaborations are more likely to be the exception than the rule. 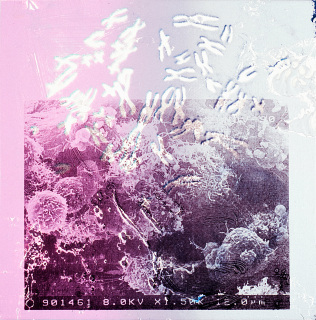 But our experience does suggest a set of positive expectations for what both scientists and artists can gain from collaborating with one another. As scientists and artists, we can expect to get as much out of art/science collaboration as we invest into it. We should bring an open attitude and enthusiasm for creative work on a project. Scientists and artists who work together should be dedicated to collaborative work and make time for regular contributions to the project. In a true art/science collaboration, scientists are not simply handing off data to artists who, in turn, package it for and communicate it to a broader audience. Just as scientists promote their own self-directed or collaborative scientific projects, they should champion their art/science collaborations. In the same vein, collaborating scientists and artists should share equal responsibility and credit for all aspects of their collaborative products. When scientists work with artists, both can expect to have their assumptions about creativity, collaboration, and science communication challenged, leading to new ways of thinking about these topics. By seeing their own work refracted through a new creative lens, scientists also can expect to gain new insights into their own ways of working. Last, scientists can expect to gain new sets of critical thinking skills in terms of art and design that in the long run will expand their scientific practice in, we hope, unexpected ways. Hemlock Hospice is on view through November 2018 at the Harvard Forest in Petersham, Massachusetts. Join us there on October 20, 2018 for a gala closing, including talks, panel discussions, and guided tours by the artist and scientist who co-created the installation. For up-to-date information, point your browser at http://harvardforest.fas.harvard.edu/hemlock-hospice. ​Aaron M. Ellison is the senior research fellow in ecology at Harvard University and senior ecologist at the Harvard Forest. 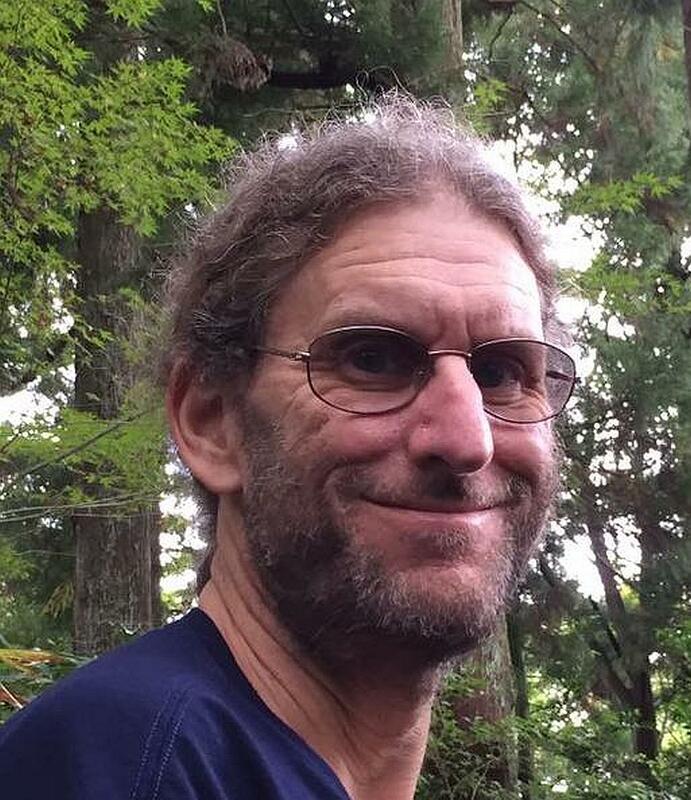 He studies the structure, disassembly, and reassembly of ecological systems, including hemlock forests, the food web within carnivorous pitcher plants, and communities of ants. Follow his blog at Unbalancedecologist.net or on Twitter @AMaxEll17. 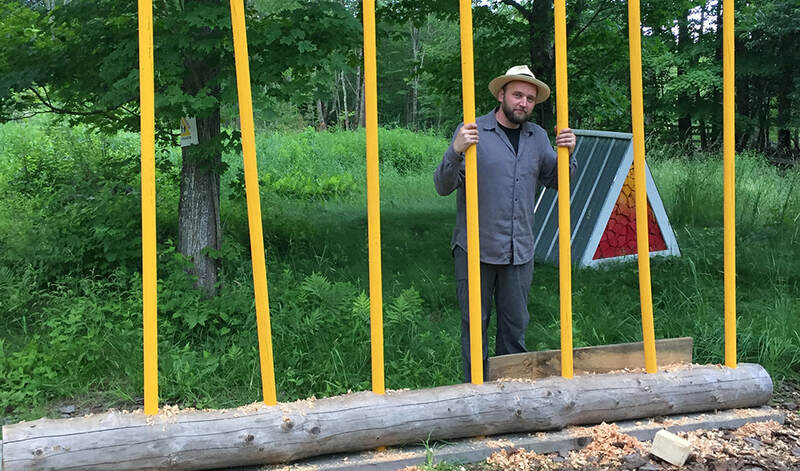 ​David Buckley Borden is a Cambridge-based interdisciplinary artist and designer known for his creative practice of making ecological issues culturally relevant to the general public by means of accessible art and design. David is an Associate of the Harvard Forest, where he works with scientists to answer the question “How can art and design foster cultural cohesion around environmental issues and help inform ecology-minded decision making.” Follow him on Twitter @dbuckleyborden and Instagram @davidbuckleyuborden.